Please email to jtfurnace at hotmail dot com. Copper Upward Continuous Casting Upward Continuous Casting is a new technology for producing long oxygen-free copper rods. It boasts the characteristics of high conductivity and low oxygen content etc. Through deep processing, it can be used as the conducting materials for wires, cables, magnet wires and varnished wires, as well as other electronic and electrical products. Advantages: 1. Great capacity. 2. easy control. 3. simple construction. 4. easy operation. 5. low energy consumption. 6. fast melting. 7. tight construction. 8. good working environment 9. little melt loss. Detailed product specifications, please email to jtfurnace at hotmail dot com. 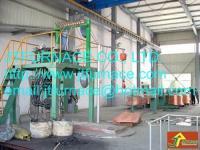 Our company is specialized exporter, manufacturer and supplier of Copper Upward Continuous Casting in china.